I know Christians whose faith and testimonies are unassailable. They are bedrock; unshakable, steady, secure. In my life, these are the people I humbly seek out when nothing less than serious intercession by praying warriors is required. I do not take them lightly. I do not petition them often. Their prayers are powerful. Lord, may it be that You will bless me to pray it forward to somebody else in need some day. By God’s Grace, may that be my testimony someday, when my faith is unwavering. Unwavering? Unwavering faith? My faith wavers all the time, and that doesn’t mean that it’s not good enough. I am struggling. Life has kicked me and those I love, battered us and at times it seems like life grinds us into dust. I tried enduring it in Grace. I tried remaining faithful and humble and patient, Lord knows I tried. At this point however, I’ve had enough. I’m DONE. I’m OUT. I am DONE. I want out. This mountain of pain, despair, disappointment and discouragement sits so heavy that some days I simply feel like I cannot breathe. It’s time to move this mountain off my chest, but I mustn’t forget to remember what it feels like. Why? Because the memory of this lingering pain will forever keep me humble, like fallen cake. Let me tell you a story about a fallen cake. A thousand years ago or so, or at least 18 when I was carrying our firstborn, dear friends of ours were christening their first child. They were hosting a reception for friends and family at their home following the service, and I was asked to bring a cake. No regular cake, this is my Granny’s 2 lb cake, so named because if a traditional pound cake has a pound of ingredients, hers has two. Anyway, pregnancy hormones must have clouded my brain. I am clearly not a scientist, so it never occurred to me that baking the cake in a cornbread pan instead of a Bundt pan would leave the center underdone and completely raw. It was a splendid specimen, golden brown, evenly baked, risen to perfection, until we cut into it. That’s where redemption creeps in. Another friend and guest at the party offered to cut and plate my dessert. I was grateful for the offer, and besides, this friend is a New York Times food stylist. My cake was about to get the gold star treatment. She cuts into the cake to discover that the center is molten batter oozing on the knife. I’m third trimester, hungry, and on the verge of tears when my girlfriend (mother of the newly christened babe) comes over laughing like a fiend. LAUGHING? Now I’m way past hurt to angry. She explains to me that she’s never seen me deliver any food item less than flawlessly. She simply cannot believe this happened to me because, according to her, in my kitchen, nothing EVER goes wrong…and despite my being mortified, I begin to laugh. 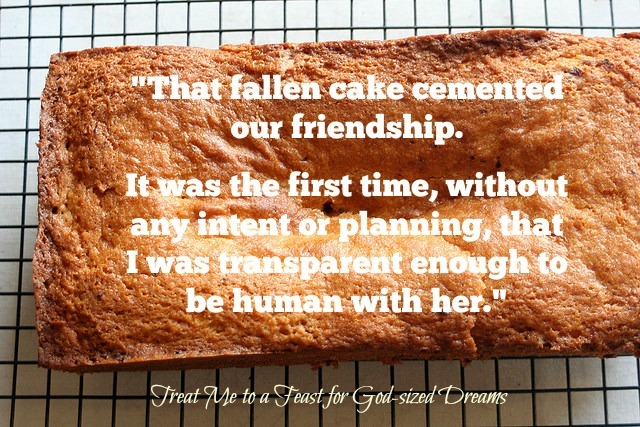 That fallen cake cemented our friendship. That fallen cake was my redemption. My faith is wavering, but it’s becoming stronger, because more deep faith is crucial to survive the season I’m going through. I claim warrior faith because I have no choice. I claim a faith that declares, “I will do anyway.” I claim a new level of faith knowing that if I do one thing, He promised that He will meet me there. Yeah, I’m DONE. I acknowledge my weakness, my frailties, all of my fears, that I am irreparably broken. I whisper…no I shout, unwavering faith? Yeah, so what? And that is why your dreams matter. If you don’t share how hard it is to show up every day, dreaming despite all reason and no matter what the circumstances…somebody watching you may never show up, at all. That’s redemption…like a fallen cake. My “done” was walking away from our church of fourteen years; the last seven of those my place of my employment. I was very involved there. I have wondered in the last few weeks if I gave up to soon. Maybe I didn’t let my cake fall, yet all I ever did there was try to fit in. The flip side of that cake is the fact that I pushed my husband to join this church when we moved here and remember feeling out of place from the start. I’m still trying to figure it out and still feeling half baked. Love the story! I need to know I will still serve a purpose somewhere. Oh, I hear you. I am so grateful that God gently gets our attention and is patient, far more than we. Keep abiding…it only took me 18 years to figure this out. Be patient. Thank you so much for these inspirational words today. I love how you said your faith is wavering – -it’s growing stronger during this difficult season — I’ll be thinking about this today. I desperately needed this encouragement! It took me forever to admit my wavering faith. I finally realized that false bravery and the facades we hold up are killing us, and preventing genuine community and fellowship. It’s time we started throwing up our hands and getting real, don’t you think? Love this! Psalms 73:26 is one of my favorite verses:) I’ve found it very freeing to reveal my frailties and rely on God’s strength. That’s awful hard for a perfectionist like myself. Thank you for you honest and encouraging post! Thank you for your kind comments. I find that my honesty is usually my best offering. If I can share my stumbles, perhaps someone else won’t have to fall as far, or as hard. What a great story about the “fallen” cake! God can take the messy mud of our lives, throw it on the potter’s wheel, and make something new and wonderful. I am so very grateful for Grace, and for the Potter. What a beautiful reflection. Thanks for letting us into your wavering heart and imperfect kitchen. Your story bolsters me and makes room for redemption. And these words are for keeping in my journal: “I must not forget the pain I’m suffering right now, no matter how hard. Without it, my capacity for Grace may lack credibility. ” Amen! Thanks for this encouraging message.